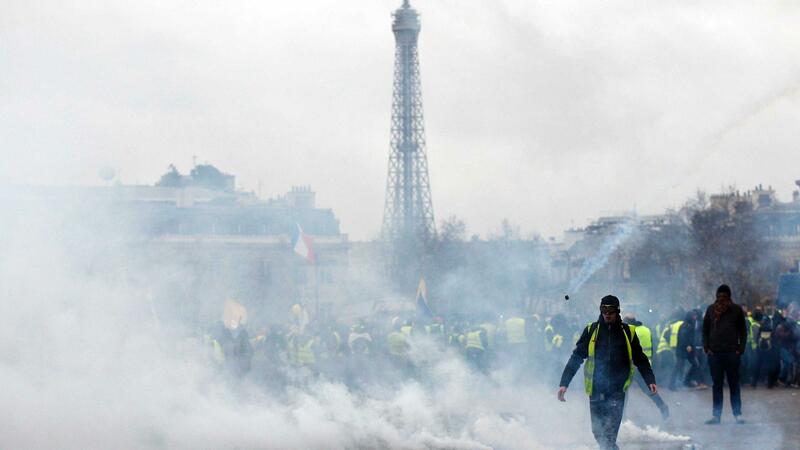 Paris police have fired water cannon and tear gas to repel "yellow vest" demonstrators from around the Arc de Triomphe monument in the ninth straight weekend of protests against French President Emmanuel Macron's economic reforms. 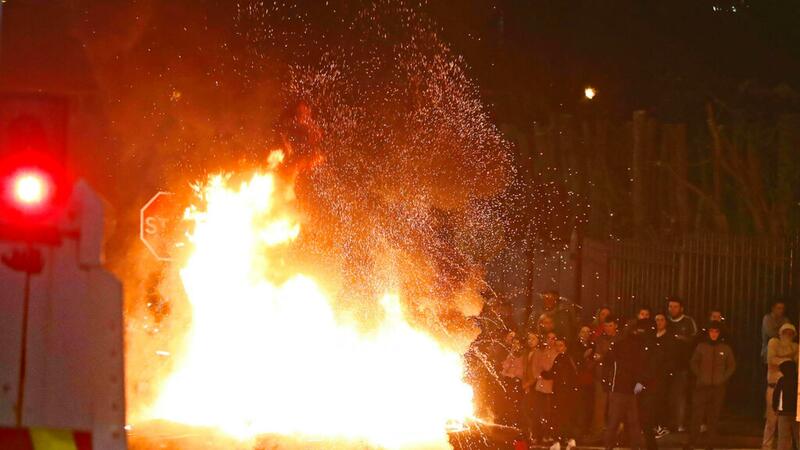 Thousands of protesters also marched noisily but peacefully through the Grands Boulevards shopping area in northern Paris, close to where a major gas explosion in a bakery killed two firefighters and one Spaniard, and injuring nearly 50 early on Saturday. Central Paris was in lockdown against another feared eruption of violence by radical elements in the "gilets jaunes" (yellow vest) movement, with bridges across the Seine river closed and official buildings such as parliament and the Elysee presidential palace protected by police barriers. Groups of protesters also gathered on and around Paris's famous Champs Elysees boulevard, the scene of disturbances in recent weeks, many of them calling loudly for President Macron to resign. "Macron, we are going to tear down your place!" one banner read. By mid-afternoon there had been no major clashes with police, unlike in previous weeks. In Paris over 50 people were arrested, some for carrying objects that could be used as weapons. Bourges authorities said nearly 5,000 yellow vests stuck to the designated demonstration area but another 500 had pushed into the city centre that was off limits for demonstrators. In Strasbourg, up to 2,000 demonstrators gathered in front of the European Parliament building and later marched to the centre of the city on the Rhine river border with Germany. Protesters set garbage bins ablaze and police fired a few tear gas grenades, but no serious violence or looting was reported. The "yellow vests" take their name from the high-visibility jackets they wear at road barricades and on the street. Their rage stems from a squeeze on household incomes and a belief that Mr Macron, a former investment banker regarded as close to big business, is indifferent to their hardships. Mr Macron, often criticised for a grandiose manner, is to launch a national debate on January 15 to try to quell the yellow vest protesters, whose unrest has shaken his administration. The debate, to be held on the internet and in town halls, will focus on four themes — taxes, green energy, institutional reform and citizenship. But aides of Mr Macron have said changing the course of reforms aimed at liberalising the economy will be off limits. 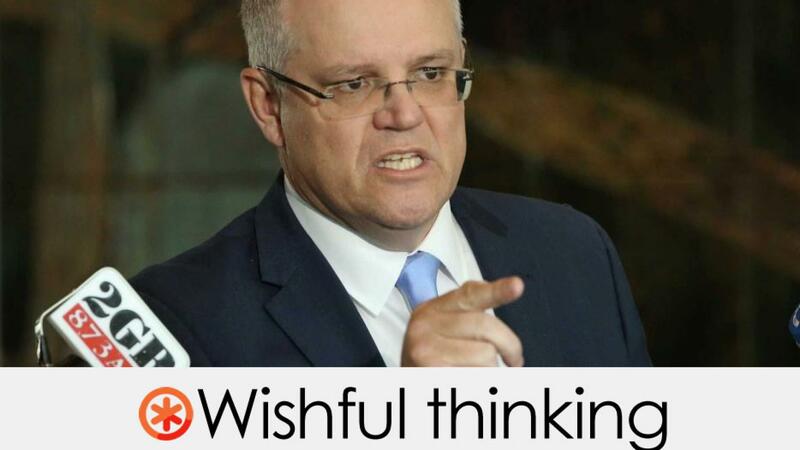 Scott Morrison said hate content could be automatically screened out online. Is he right? Can hate content on social media be automatically screened out by algorithms?